If you are the curious type and would like to compare how other Linux distributions package their desktops, then you are in luck. Now you can get a feel (a tiny one though) of different Linux distributions without installing and trying them out. 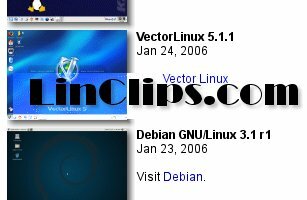 LinClips has put together a collection of flash videos which gives a peep into the desktops of different Linux distributions including the menu layout and the softwares bundled with them. What is even better is that each clip runs for exactly 2 minutes which brings it to the reach of people with low bandwidth internet connection.